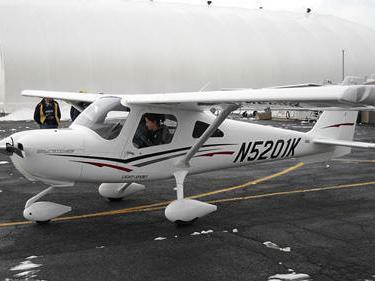 June 27, 2012 - Cessna Aircraft has challenged high-energy aviation students from around the country to see who can generate the most awareness and hands-on experience for the innovative Cessna Skycatcher. The inaugural "Cessna Discover Flying Challenge" commenced on June 23 at the Cessna Open House in Independence, Kan., an event which commemorated the company's 85 year anniversary. The Cessna 162 Skycatcher is a side-by-side two-seat, high-wing, strut-braced, tricycle gear light-sport aircraft (LSA). The latest aircraft in the Cessna general aviation product line, its intended market is flight training and personal use. In December 2009 the company delivered the first production Skycatcher to its initial customer, Cessna CEO Jack Pelton's wife, Rose Pelton. The pilots left Cessna's Independence facility on Saturday in a Skycatcher with customized paint schemes that identify their participation in this program. Throughout the challenge, they will participate in various fly-ins, air shows and Cessna Pilot Center events over the course of the next five weeks. As part of their creative efforts to drive awareness and virtual engagement in their journey, they will be blogging discoverskycatcher website, posting videos on the Cessna YouTube channel, and updating Facebook and Twitter feeds documenting their adventure as they go from one destination to the next. "The Skycatcher is such a unique and accessible aircraft that we wanted to introduce it to the flying public in a manner that reflected the same. We could have opted for traditional advertising, but the Skycatcher is something that you just have to experience – it is an awesome light sport aircraft," said Tracy Leopold, Cessna business leader for the Skycatcher. "We are quite excited to have certified flight instructors as our interns – they have the unique ability to introduce people to the product and take folks on training flights to experience the aircraft firsthand. We have found that once people experience flight in a Skycatcher, their interest in the product increases." One of the interns involved in the challenge is Zoe Cunningham, a senior at Embry Riddle Aeronautical University in Daytona, Fla., majoring in aeronautical science with minors in air traffic control and applied meteorology. According to Cunningham, "the best part of the Challenge will be sparking that passion for aviation in others and sharing the joy of flight with the Skycatcher." Fans can follow each pilot's journey through the Cessna Discover Flying Challenge website or through links on the Cessna Facebook page followers can also track their progress and see the schedule of appearances around the country. The winner will be announced when all pilots reunite at the EAA AirVenture Oshkosh convention and fly-in in Oshkosh, Wis.
Conor Dancy, a native of Leesburg, Va. and a senior at George Mason University, is looking forward to the next few weeks of flying but is especially excited about attending the fly-in at Oshkosh. "I couldn't be more excited about this program. I already have more than 60 hours in the Skycatcher and absolutely love flying it," Dancy said. I can't imagine a better way to spend my summer and can't wait to see everyone in Oshkosh."